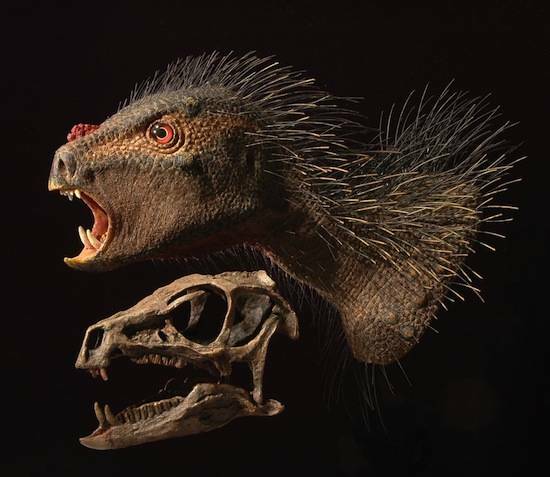 A two-foot long dinosaur with the beak of a parrot, teeth of a vampire and covered in some sort of bristly quill stuff is the latest new dinosaur to be identified. The Pegomastax africanus scampered around the earth 200 million years ago, announced Dr Paul C. Sereno, a palaeontologist at the University of Chicago, describing his new dino finding in the journal ZooKeys. The new dino, Pego, is a member of the Heterodontosaur family, and measured up at less than two feet and weighed less than a small cat. 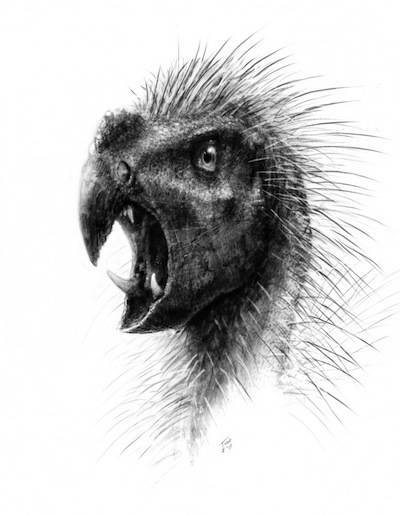 It had a beak, fangs and basically looked like a terrifying bitey scrag-beast according to the mock-up created by the University of Chicago. A Pegomastax skeleton had been sitting in a drawer in Harvard for the past 50 years, said the Sereno, who explained that he had only recently analysed the chunk of red rock where the bones were embedded. The rock was unearthed during a dig in South Africa in the 1960s. Waxing more lyrical about the small rock-embedded bones, Sereno speculated that the beaked two-legged cat creature may also have been covered in porcupine quills, saying that it would have been like a "nimble two-legged porcupine". The volcanic ash in which the skeleton was buried has preserved hundreds of bristles that spread from Pego's neck to the tip of its tail.